This thesis aims at understanding what is hindering the city of Hargeisa from effectively dealing with floods and droughts. The country is strongly reliant on natural resources and rainfall for livestock and agriculture activities but climate change impacts are compounding the existing problems of lack of development and weak, under-resourced institutions. In an arid environment already prone to extreme climate events and temperatures, measures for disaster risk management can go hand in hand with adaptation to climate change, as also explicitly recognised by national policies. In 2007 a decentralised and multilevel national authority for disaster preparedness was established by law. However, its lowest level has so far not been implemented, and the district disaster management committees (DDMCs) remained only on paper. As the UN recently launched a project for creating a DDMC in Hargeisa, it is of crucial importance to understand how barriers, their interactions and the relations among the different levels of the DRM governance system affect the implementation of DDMC as a measure of DRM and adaptation to climate change. The literature on governance frameworks and barriers to local planned adaptation support the efforts towards understanding not only which barriers occur, but also their origin and the influence that actors can have on them, considering their position in time and on the jurisdictional scale. The single case study research methods include fieldwork, semi-structured interviews and a qualitative secondary data research on Somaliland’s DRM and adaptation governance situation. Respondents are all local actors directly involved in the governance of DRM of Somaliland, from international, national and urban level governmental institutions and NGOs. Informants are local experts in public administration, academics and experienced development practitioners rooted in Hargeisa. In line with literature, institutional deficits are found to be crucial obstacles to the implementation of this adaptation and DRM measure, in addition to those arising from constrained human, financial and information resources that affect all levels of the governance system in their interplay. Limited awareness among stakeholders and decision-makers, a dysfunctional and fuzzy distribution of political and administrative competences and little vertical and horizontal coordination strongly affect the adaptation process’s costs, resources, efficiency and incentives to implement the action. Mayor findings acknowledge that the barriers to effective adaptation to climate change in Hargeisa are systemic in terms of their origin. The wide majority of problems stems from either the human-environmental system of concern of floods and droughts management or from the wider governance and socio-economic context rather than from specific behaviour of the actors of local governance. In fact, more than half of the barriers are located above the jurisdictional sphere of competence of urban institutional stakeholders, mostly belong to the recent past. For this reason, international aid has the potential to play a big role in Hargeisa not only because of its additional resources, but especially because it can address the institutional disconnection between the national and urban levels of the governance system for droughts and flood management that is currently cause and effect of the occurring barrier dynamics. 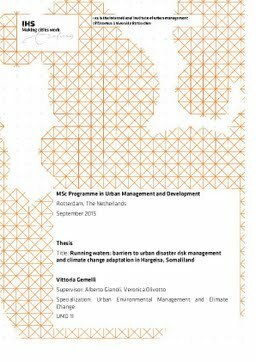 In current conditions in fact, changes in urban disaster management can occur only if the whole governance system for DRM and not only actors of a single level address the barriers. This implies a need for upper levels in pushing decentralisation not as ‘passing the buck’ but as creating a more smooth structure for all actors, including the local government ones, to be empowered to act at their level and contribute to DRM for the city of Hargeisa. Thesis Advisor Gianoli, A., Olivotto, V.